After an eye-opening talk with Bill White, the man who rallied the community of Twin Bridges together to erect the nation’s first ever Bike Camp, we’ve been thinking a lot about bicycle touring and its effects on small towns. 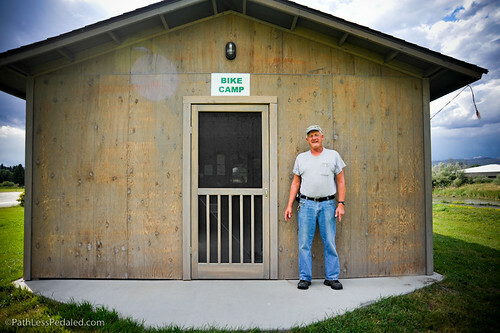 He started Bike Camp as a means to get touring cyclists to stay in town and to benefit the local economy. He became enamored with the many stories of passing cyclists but also saw an opportunity for the town of Twin Bridges to benefit from hungry and tired bike tourists riding through. For Bill, it was simple. To not do something to keep the cyclists in town was like “watching gold flow down the river.” So he dreamed up Bike Camp and raised the funds and community support to see it happen. It was such a simple insight, but one that we as bike tourists always clamor for. Show us a modicum of bike friendliness and we’ll be eternally grateful. Heck, we’ll even spend money in your town. This got me thinking about our spending habits and how it would be different if we were in a car. We’re pretty average as far as touring cyclists, shooting for about 50 miles a day. Far enough to move through the landscape, but slow enough to do some fishing and eat some pie. 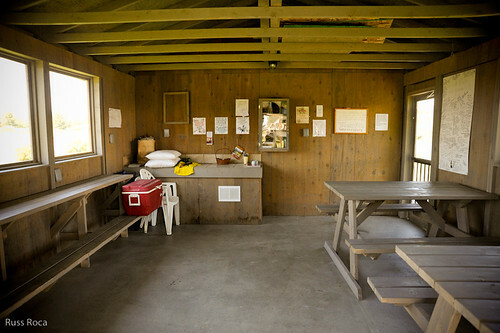 Because of our limited distance per day and the massive amounts of calories we’re expending a day we eat a lot and require a place to overnight (camp, RV park, motel, etc.,). I began thinking of how our spending habits would be different if we were driving. Take a 200 mile road trip. It would be easily accomplished within a day in an automobile. You’d probably stop for lunch, refill the gas tank along the way and get dinner and lodging at your final destination. You might pass a handful of small towns along the way, but since you’re moving so fast and not expending any calories, chances are you probably won’t stop unless you have to use the bathroom. Those small towns would just be a blur from inside your car. Take that same 200 mile stretch and think of how a bike tourist would move through the landscape. If they’re 50-mile-a-day cyclists like us, they would require 4 nights of lodging or camping. Because we’re constantly burning calories, that same trip would require 12 meals or snacks in between (either cooked with food bought from local markets or meals at the local eateries). We would definitely stop in every town to refill water bottles, stock up on food, use the restroom and spend the night. 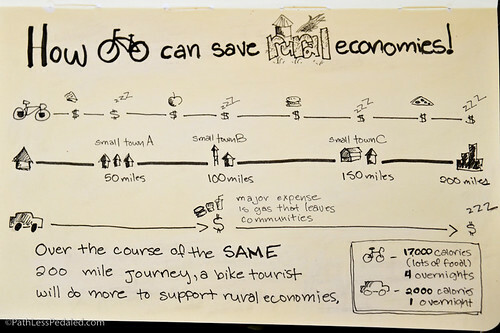 Given the same 200 mile stretch, a touring cyclist will make more of an economic impact on the small towns along the way than a person driving in a car. Now imagine, if small towns across the country welcomed cyclists by offering simple accommodations like the Bike Camp, especially those along Adventure Cycling routes. Not only would it benefit cyclists, but small towns would benefit as well with a constant stream of tired and hungry bike tourists coming through town. 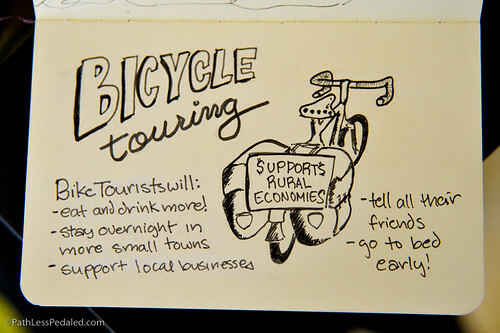 The more accommodations, the more people touring, the more people spending money in small towns. It’s a dream for sure. But after seeing Bike Camp, in Twin Bridges and talking to Bill, we had a momentary glimmer of what bike tourism could be. Yesterday while on a touring trip from Talkeetna, AK to Denali National Park we stopped in Cantwell. Out of the paying customers 9 out of 12 were bike tourists. We stop and spend money at small towns so much more often and if people would simply set themselves up to cater slightly to us they would reap the rewards! This is precisely the approach used on the Elroy-Sparta trail in Wisconsin, where the stream of cyclists on the approximately 100 mile rail-trail provides an important source of revenue for the small towns (populations of 1500-10,000) abutting the trail. Last Monday 1 Aug while returning to Nashville TN from Elkins WV I made a detour to Damascus VA to ride a few miles of the Virginia Creeper trail on my old beater bike. I stayed at the Lazy Fox B&B where the long-time proprietor Mrs Ginnie Adams, 87, told me that the creation of the 34-mile Virginia Creeper multiuse trail out of the former Virginia & Carolina RR ROW transformed Damascus pulling the town out of decades of economic doldrums. Part of the AT goes thru here too. A friendly town now doing well catering to the needs and interests of visitors using a great trail. Another case in point: the Katy Trail through central Missouri. The Trail follows the Missouri River – not the Interstate. So you have to ask yourself: how many of the small towns along the Trail would ever even SEE a tourist if the Katy hadn’t been built? Wonderul article! Reminds me of some of Wendell Berry’s essays on how small farms benefit communities in similar ways rather than a big industrial fuel dependent mega farm. Have you read his work? I think you are really onto something with your new drawing/writing. I would buy and treasure anything you publish! There may be a “build and they will come” impetus to some degree – for those who have the insight. One extreme fantasy (of mine) could be a self-supported exclusive non-motorized route mutually supporting a variety of levels and modes of lodging, entertainment, dinning, and merchandizing along that route. Although many of the facilities could have access to the outside world, the route itself could be its own world experience. What a trip. A new reason for a small town to be. Great article. Check out RAGBRAI an annual 20,000+ traveling through small towns across. Iowa. Its so much fun, and the boost to the local economies is astounding…my family does it every year. Nice article. Just one style comment, though. I had to click the link to see what state this was in. Might be nice at first mention to say “Twin Bridges, Montana” rather than just “Twin Bridges”. You guys travel around a whole lot, and sometimes it takes me a minute to figure out exactly where you’re writing about. As Nate mentions above, the Katy Trail accross MO is a good example of bike tourism keeping sme small towns alive, and in some cases vibrant. Lots of litte resturaunts along the way, especially on the St Louis side. We talked to a few people along the way that said the local bussinesses need to do a better job of advertising on the informanional boards along the way. A good opportunity for the Chamber of Commerce to get involved. Really I think this is a taste of our future. And similar for mountain biking too. Fun to read about the Bike camp, We have been running a Bicycle exclusive camping option around our barn in central Washington state (Winthrop WA). We get about 100 cyclists a year staying with us at our “Bicycle Barn Camping” and it’s always fun to meet the bicycle tourists.